Junior angler Lilly Hancock with proud Father Brent Hancock & a nice flathead. PORT Stephens turned on almost picture postcard perfect conditions for this year's Club Marine Trailer Boat Fishing Tournament. Around 550 anglers and 220 trailer boats of all shapes and sizes made the trek and enjoyed some top fishing and socialising over the weekend. This year the tournament leapt into the twenty-first century and posted live reports with photos as fish were being weighed (with many released) and regular scoreboard updates onto the Club Marine Trailer Boat Fishing Tournament site on Facebook. This worked exceptionally well as people were able to see what was on the board to help them decide whether to weigh a fish or release it straight away. The pointscore system means that only the top three fish in each category count for points so once a 0.395 kg flounder or a 15.447 kg cobia is in third place there is no point bringing your fish in if it is lighter than this. This system means we weigh in very few fish during the tournament given the high number of anglers competing. As always, we welcomed many family groups, and in quite a few instances we hosted three generations of a family. That’s not to say there wasn’t plenty of teams of mates who use the tournament as a way of spending a weekend with friends or competing against their friends. While many of the species didn’t turn up in numbers or sizes until the last day, mulloways were plentiful and very competitive this year. Tony White on Pelican won this species category with a beautiful 23.591 kg fish. In the Juniors section, Amy Falko on Big Daddy scored with a 12.266 kg fish. Leon Arthur with a 1.056 kg snapper. With the tournament irst run in 1994, the rules have been deliberately kept very simple for all to understand. And although it is a very simple tournament to compete in and enjoy, it is extremely hard to win. Therefore, the species and overall winners are amongst the best of the best in any company. The effort that the winners put in over the tournament should not be underestimated. For them, it is the prestigious title, not the prizes. For many however, the many lucky draws offer a chance to share in the sponsors largesse. This year, Lowrance randomly awarded a number of their new models including a 12” HDS-12 with Active Imaging valued at $4,799 plus other models totalling around $15,000 in value. All lucky draws. Other lucky draws included Life-Cell safety boxes, BOAB Boat Hire certificates, Samurai rods, Capture Imaging Photography sessions and Alistain s/s gaffs. 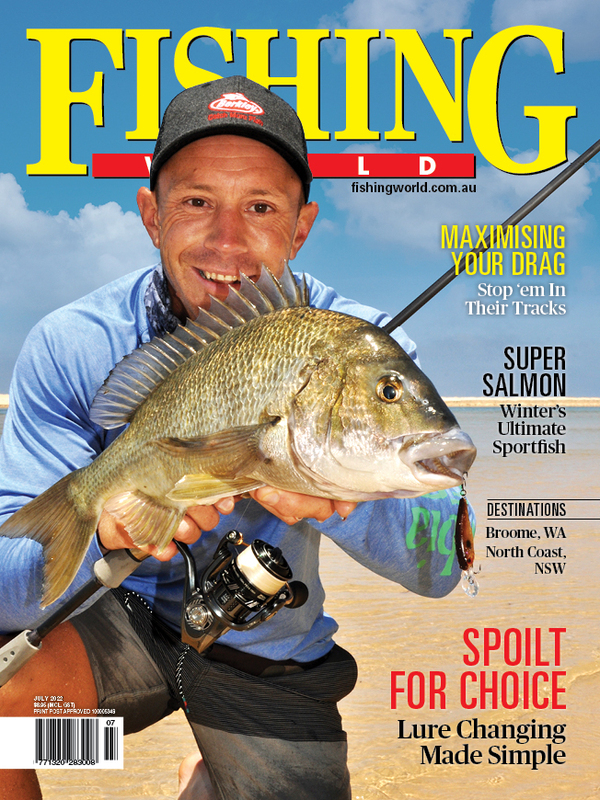 Local tackle outlets Duffs at Salamander Bay and Tackleworld Port Stephens provided gift certificates and our accommodation partners Winning Holidays, Allogio, Cote D Azur Apartments, and Port Stephens Beachside Holiday Parks provided accommodation package prizes. Local Formosa and Suzuki dealers, Wayne and Kim Palise at Bay Boat Sales provided service discount certificates for lucky draws. Whilst we may have awarded 90 species and champion prizes, there were probably more than this in lucky draws. In her last year as a Junior, Amy Falko leapt in at the last minute to place in several species prizes to win the 2019 Junior Champion Angler prize with a commanding 36 points ahead of tournament newcomer Lilly Hancock fishing on Tackleworld Port Stephens with 19 Points. Junior species winners won prizes from Shimano, Club Marine, Atomic and Gamakatsu. There were a lot of new Juniors this year so next year looks like being very competitive. Francis Watkins releasing a flathead next to his Surtees. In the Seniors, past Champion Angler Paul Lennon won the flathead species with a huge 6.056 kg fish as well as third with 4.183Kg. It was nice to see all the large flathead being weighed and then released in a healthy state. The ever-popular Chiller Bags from BlueBottle Marine helped with this over many species. However, 2019 was not to be Pauls year. At final count, the 2019 Champion Angler was Phillip Millauro fishing on Sammi-Jay whose catch included a 21.783 kg cobia, 1.569 kg morwong and 3.982 kg teraglin for 17 points. Runner-up (and past winner) Ben Doolan scored with a first placed kingfish (14.498 kg) and first, second and third in snapper for 14 points. Senior prize winners shared prizes from Shimano, Mako Eyewear, Alistain, Club Marine and BlueBottle Marine. Accolades to Marine Rescue and to all the volunteers from Shoal Bay Fishing Club for their assistance over the weekend. Without the assistance of these 2 groups, whose members selflessly give up their time, the tournament could not be run. We look forward to welcoming old and new friends alike bay to Port Stephens in 2020 on April 3, 4, 5. Please click HERE for all the results. 2019 Club Marine Trailer Boat Fishing Tournament Champion angler Phillip Millauro and son Jayden with Jayden’s bonito and flounder.